Andrew Snyder presents 9 Meditations, a performative installation at Open Source Gallery. Traditionally, the act of throwing is merely a means to an end; the potter’s wheel, a tool. Customarily, the act of throwing is documented by firing the work. 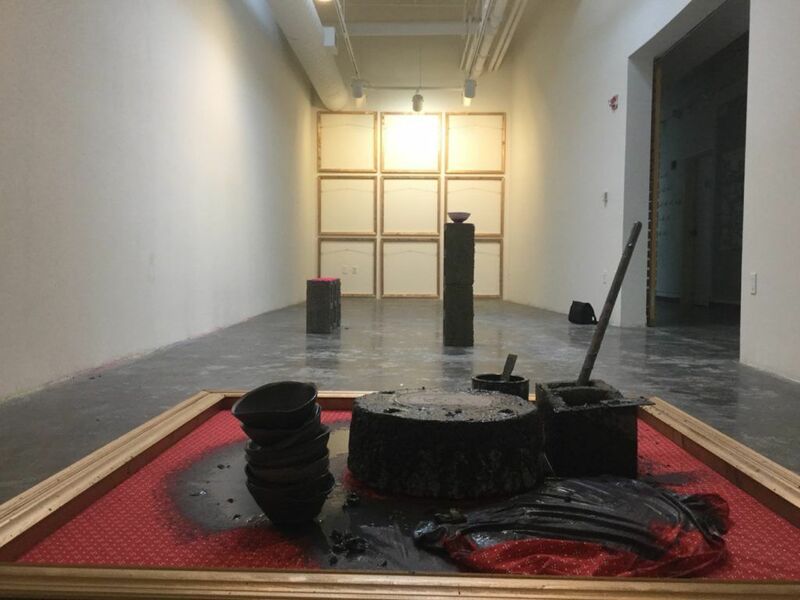 During 9 Meditations, Snyder, rather than relying on the finished product to demonstrate his skill, records his time on the potter’s wheel by transforming the fabric beneath the potter’s wheel into a canvas for the documentation of his work. 9 Meditations pays tribute to the tradition of demonstration by way of performance. There is a long history of demonstration in the crafts–whether weaving, smithing or throwing–as a performance that shows the mastery of the craftsman’s skill. Snyder does not place focus on the bowls made at the potter’s wheel, but concentrates on throwing. The repetitive process of throwing, as demonstrated during six two-hour performances the day before and the day of the opening reception of 9 Meditations, puts the potter into a state of meditation. While throwing, Snyder takes time to reflect, creating bowls that upon first look might appear similar, but result from a process that is ever-changing with the circumstances of Snyder’s reflection. The monotony and boredom of repetition often leads Snyder into contemplation about the people in his life. Snyder incorporates his contemplation about friends, family and neighbors into the performance using fabric that reminds him of specific people. Fabrics are sought out by Snyder, an avid thrift store shopper, at secondhand shops or requested from those they represent. The found fabrics give insight into Snyder’s meditations, which transform each performance and bowl into something subtly different.